Description: Geiranger offers landscapes straight out of a fairy tale, with majestic mountains that have snow covered peaks and waterfalls that are riveting. The blue of the fjord water, the steep cliffs along the sea, and the lush vegetation that is abundant in the area provide a picture perfect backdrop and fabulous contrast. A must experience for visitors to the area. 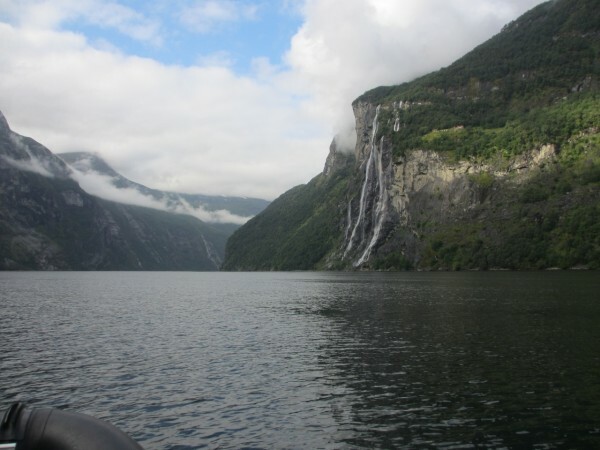 Our Experience: The entire Geiranger area is a very beautiful place to visit. The main area itself has a few touristy shops and some cafes for visitors. We enjoyed exploring and taking in all of the scenery. Description: Touring the Geirangerfjord by boat is the best way to get terrific views, and the boat covers some of the most beautiful scenery in the area including the Seven Sisters waterfalls. We were told that at times passengers may even see porpoises and other wildlife (though we did not). Our Experience: The Fjordsafari RIB boat was a nice, fun way to see the Geirangerfjord. Even our 2 year old was allowed on the boat, it didn’t go too fast. You will get a weatherproof suit to keep you warmish and some very nice quite close views of the Seven Sisters waterfalls. 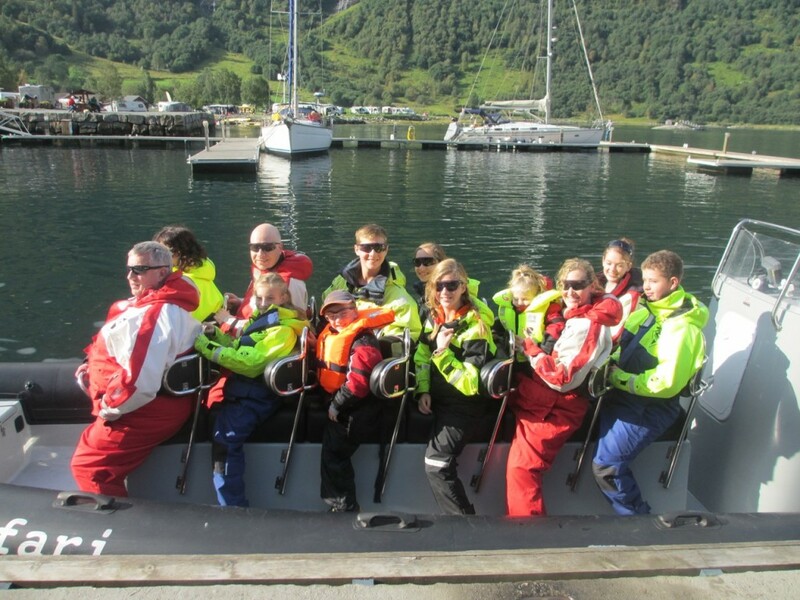 We spent about 45 minutes on the water and the cost for our family of 8 was NOK 1,700, or about $280 US. These tours tend to get booked in advance so I recommend that you reserve in advance. Our whole family enjoyed this activity and we all give it a big thumbs up. Description: A Flydalsjuvet bus tour takes passengers along a route that has a considerable history and tradition. 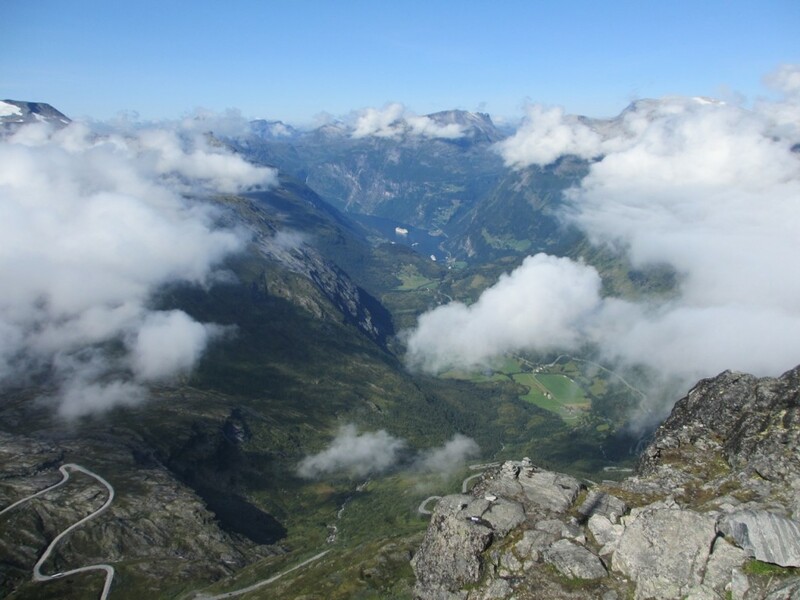 Some of the most gorgeous scenery in Norway can be seen along this route, and the tour ends at the viewing platform that has both upper and lower levels. Visitors can gaze at an incredible view of the Geiranger and surrounding areas. Our Experience: While we don’t normally take bus tours, we decided to take one to the Flydalsjuvet overlook. Absolutely beautiful views along the way and when we arrived at the platform. Caution: our 7 year old threw up along the way because there are lots of hairpin turns. Another downside is that the bus tours do not leave adequate time for exploring at the top (in my humble opinion). You will have enough time for photos and to look around for a bit, but not much more. Despite this, thumbs up from the whole family on what we saw. Watch to make sure your kids don’t venture too far on the cliff, but do let them build little rock towers the way so many others have done. We had hoped to get off the bus at “Hole Bridge” and hike from there to Storsetterfossen, a waterfall that you can walk behind. This would have taken about an hour, and then we planned on hiking back from Storsetterforssen to Geiranger, which is around an hour and a half. But we didn’t have enough time so we took the bus tour all the way up and back down again.